Avoiding hull-busting objects in your path is the name of the game. Here’s how to play. 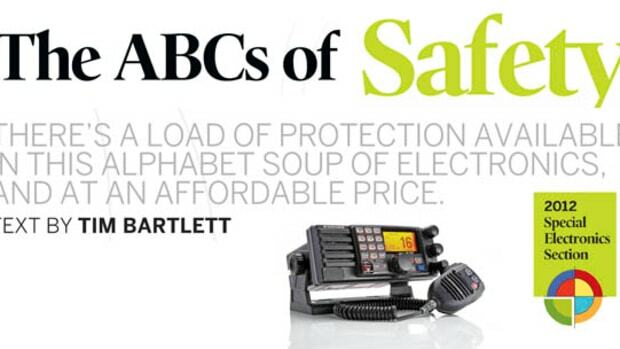 has become reality for boats with a new bow transducer. It’s dark. But the sea is calm and you’re making good progress, when all of a sudden, out of the corner of your eye, you catch a flash of something close ahead, lit by the glow of your nav lights. Was it a shipping container? Or a wave breaking on an uncharted reef? Whatever it was, it’s too late to do anything, other than brace yourself for the crunch. Nine hundred ninety-nine times out of a thousand or more, it was nothing more than an isolated wave, or a low-flying bird. But wouldn’t it be great if our depthsounders and fishfinders could tell us about underwater hazards before we go over them, rather than afterwards? EchoPilot puts ping results on a screen for the user to discern threatening obstacles. That is where forward-looking sonar comes in. As most of us understand by now, conventional ping sounders and fishfinders work by transmitting short squeaks of ultra-high-frequency sound downwards, and measuring the time it takes for the echoes of those squeaks to return from the seabed. From that, and the knowledge that sound travels through water at just under 5,000 feet per second, it’s simple math to work out the depth. 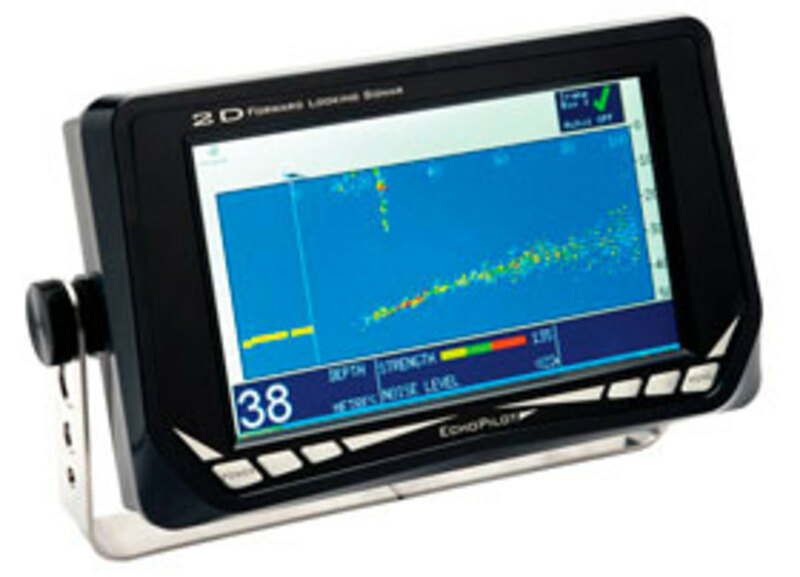 The main difference between a depthsounder and a fishfinder is that the depthsounder has to pick out the echo that represents the seabed from all the spurious echoes received from fish, bubbles, debris and those that have bounced backwards and forwards between the seabed and the surface, while a fishfinder uses its graphic display to show all those fascinating extra echoes that the sounder has been trying to ignore. 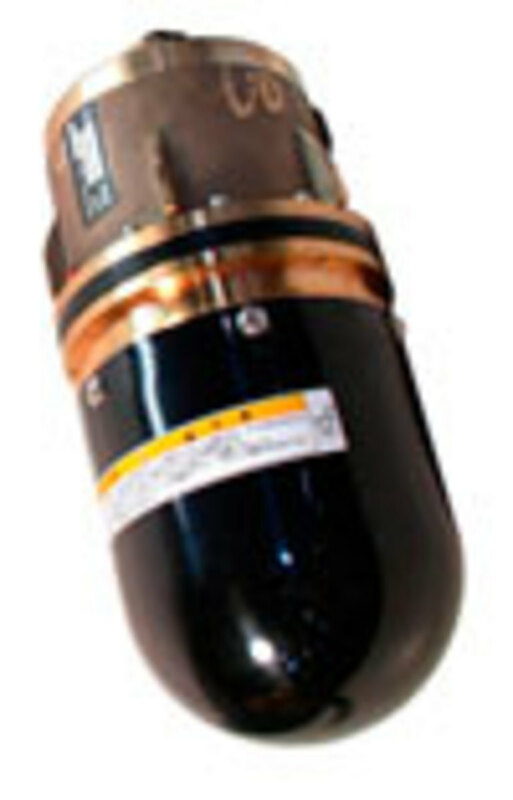 put forth from a bow-mounted transducer. The system processes the ping returns and puts together a picture of what the bottom structure looks like—exciting stuff. 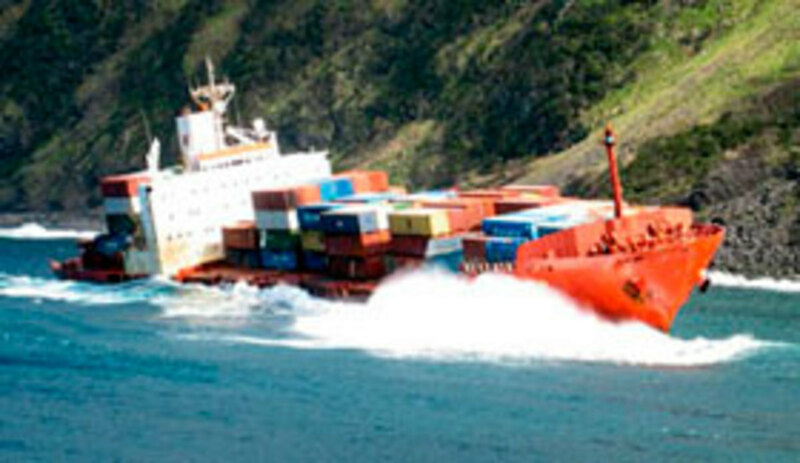 Phantom shipping containers floating just below the surface are considered a bane to cruisers. Here’s the real story. Well over 100 million shipping containers cross oceans every year. Almost all of them reach their intended destinations, with only a tiny percentage being lost at sea. According to the World Shipping Council, 2013 saw 5,578 containers lost at sea—of which 4,293 came from the sinking of a single ship. How long it takes for a container to sink depends mainly on its contents, but with only a few thousand lost containers spread over millions of square miles of sea, your chances of ever seeing one are remote. And the odds of actually hitting one are infinitesimal. 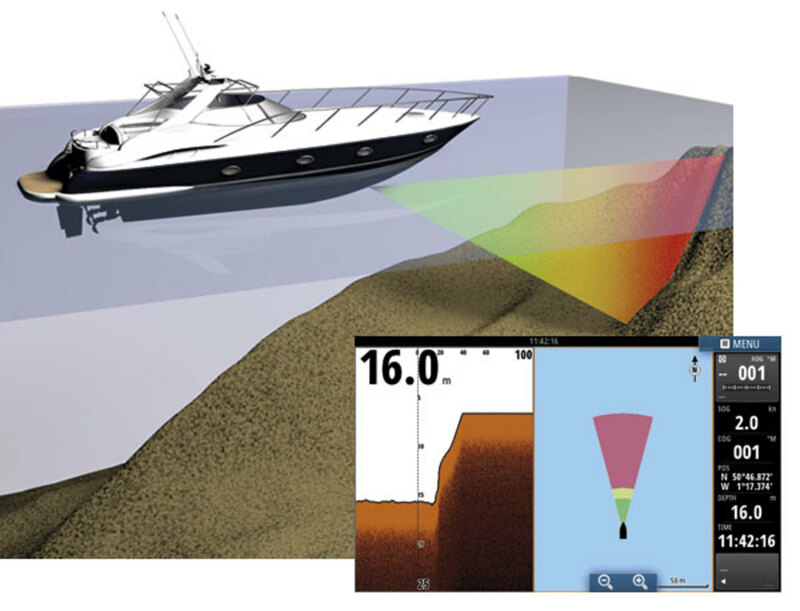 Like a fishfinder, a forward-looking sonar also uses a graphic display to paint a picture of the bottom profile. The crucial difference is that forward-looking sonar transmits its pulses forward instead of downward. Of course, there’s more to it than that. The biggest issue is that we don’t just want to know if there is something ahead of us: We also want to know how deep it is. A forward-looking sonar can’t simply measure the distance down from the surface, as a fishfinder does, so it has to measure the angle between the object and the surface. For the last 20 years, forward-looking sonar for recreational boats has been a niche market dominated by two small companies, each with its own solution to this problem. 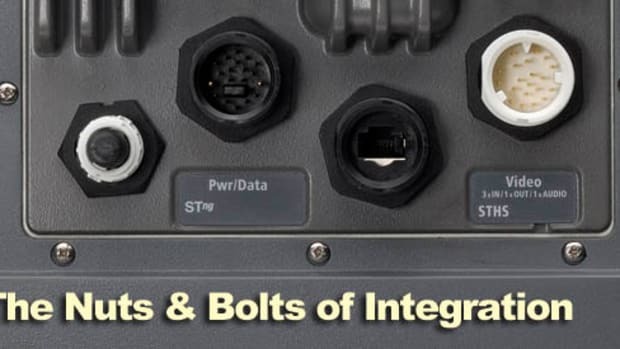 U.S.-based Interphase Technologies—now a subsidiary of Garmin, but currently out of production—used directional transmissions, scanning a narrow beam of ultrasound up and down or from side to side like an underwater radar. Using a narrow beam is very efficient, allowing Interphase to claim a maximum range of 1,200 feet from a 450-watt transducer. But it takes half a second for a pulse to travel that far out and back, so it can take anything up to 20 seconds to build up a complete picture—20 seconds in which a 30-knot boat would have travelled almost as far as the forward-looking sounder can see. Another problem is that although the ultrasound beam is “focused” to some extent, it is nowhere near as narrow as the microwave beam of a decent radar. With the beam covering a 90-degree vertical arc 12 degrees wide, it cannot show whether an object 200 feet ahead is on the surface or 20 feet down in 50 feet of water. The view beneath the boat is getting better in all directions. 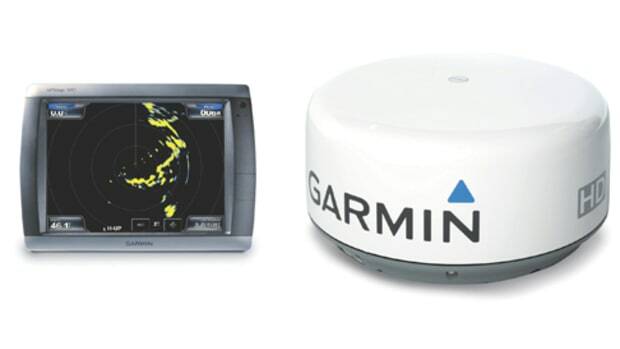 Several companies are now offering scanning sonars for fishing—generally intended to be used when the boat is stationary or moving slowly. 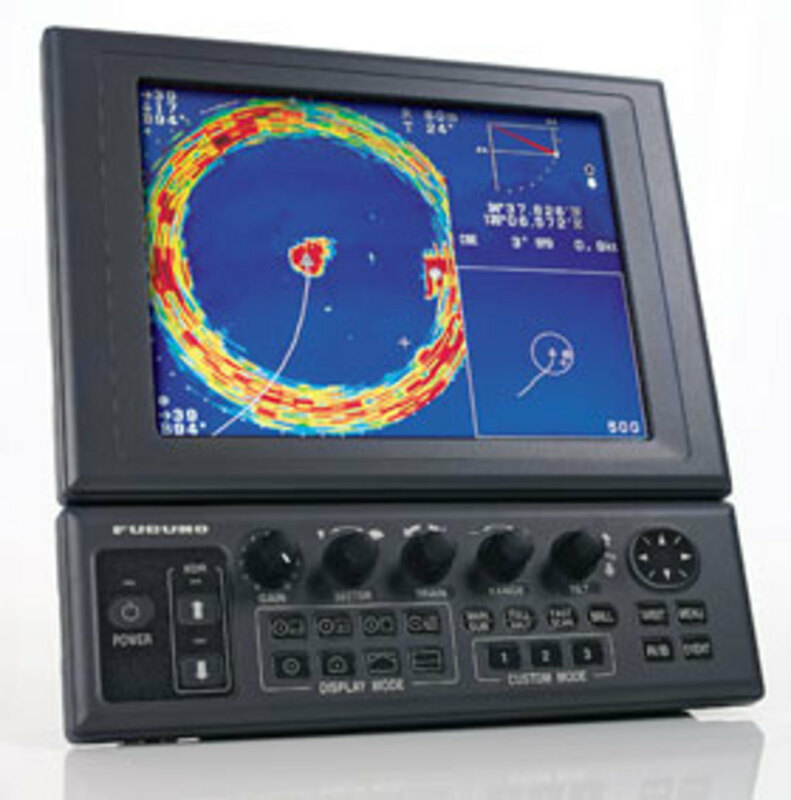 It’s a technology that has “trickled down” from the world of commercial fishing, so it’s no surprise to find Furuno in there, selling “searchlight sonars” with five-figure price tags to the owners of sportfishing battlewagons. Furuno’s CH270, for instance, sells for about $13,000, complete with its own 10.4-inch display (above). 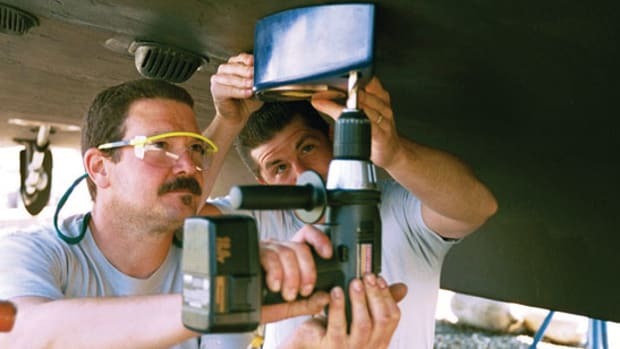 Its transducer (shown below) is a 6-inch dome, that can be retracted into a tubular housing in the boat’s hull whenever the boat speed is likely to be more than 20 knots. It has no moving parts, but uses a thousand individual “oscillators” (transmitting elements) to create a searchlight beam of sound that can sweep horizontally through 360 degrees, or vertically through 180 degrees. With an 800-watt transducer, it offers a nominal maximum range of 2,500 feet, and can sweep a full 360 degrees in less than 40 seconds. 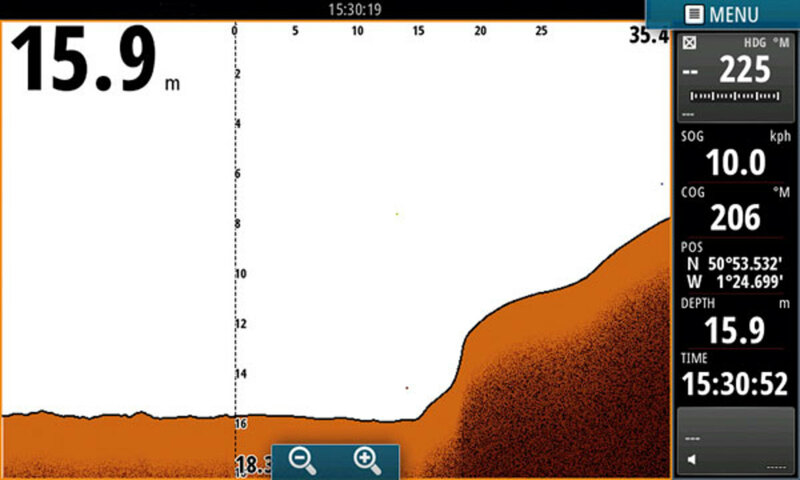 At the other extreme, Lowrance produces SpotlightScan. Priced at just under $500, SpotlightScan is aimed at freshwater fishermen, and features a transducer that clamps to the underwater unit of a trolling motor. The transducer produces two fan-shaped beams of sonar energy, which can be swept through 360 degrees by rotating the trolling motor, to build up a circular picture of the underwater environment, out to a range of 150 feet. Humminbird’s 360 Imaging does exactly what its name suggests. It uses Humminbird’s side-imaging technology, but with the transducer mounted inside a sealed pod, and free to rotate very much like the scanner of a radar to paint a circular picture, similar to that produced by the Lowrance. 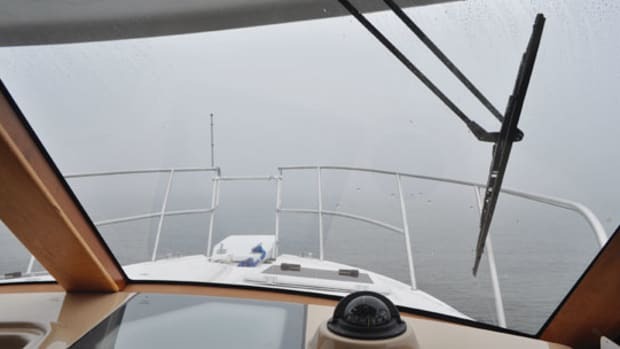 Instead of using directional transmissions, EchoPilot floods the water ahead of the boat with ultrasonic pings, then measures the angle from which each echo returns to the transducer. Like a floodlight compared with a spotlight, EchoPilot’s broad beam of ultrasound doesn’t have the penetrating power of its rival, so even top-of-the-range FLS 3D and FLS 2D models can only look 650 or so feet ahead. The payback is that every pulse produces enough echoes to build up a complete picture, so it is able to update the screen image every second or two—and with greater detail than Interphase can. One problem common to both systems is that the distance at which echoes can be received from the seabed depends on the depth. At a distance of more than about four or five times the depth, the pulse will hit a level seabed at such a shallow angle that it won’t be reflected back to the transponder. Upward-sloping bottoms can often be seen at ten times the depth or more, so the edges of dredged channels show up clearly, as do rocks and vertical surfaces. 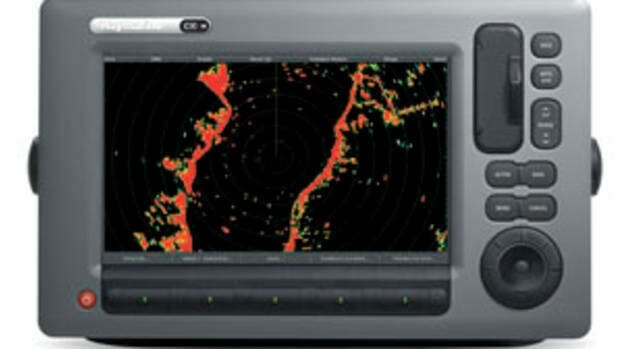 With Garmin still “evaluating,” it was Simrad that become the first of the big four electronics manufacturers to come up with a forward-looking sonar for recreational boats, with the launch of the Forwardscan Transducer—a wedge-shaped device that protrudes downward from a 2-inch through-hull fitting, with a single-cable Ethernet connection to Simrad NSS evo2 or NSO evo2 MFDs. It looks very much like Echopilot’s transducers, and works in much the same way: It transmits a fan-shaped beam of sonar pulses into the water ahead of the boat, and analyzes the returning echoes to build up a two-dimensional picture of the seabed, up to about 650 feet or so ahead, or, more typically, about four to five times the actual depth. 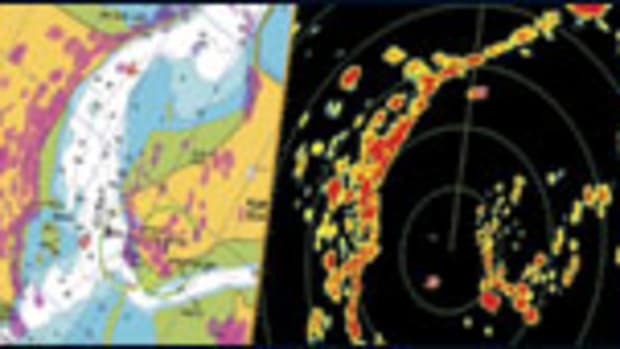 Perhaps the most obvious distinguishing feature of Simrad’s version is that the software interpolates the information provided by the returning echoes, and supplements the speckly, fishfinder-like picture with a far more solid-looking trace that is easier to interpret—though some might say it inspires more confidence than the quality or consistency of the returning echoes really warrant. The message that comes out of this is that forward-looking sonar is no substitute for navigation: It is simply not capable of warning you that you are about to start plowing the seabed if you are roaring around at 30 knots. 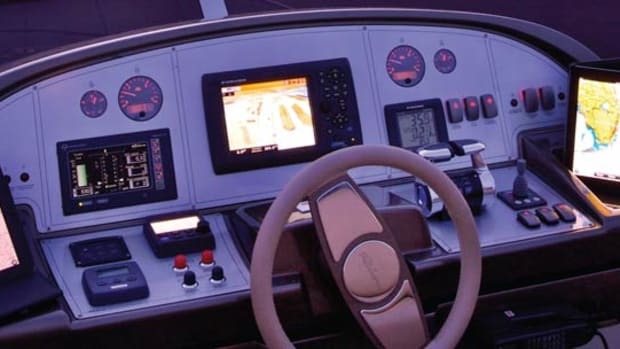 Boaters who have bought forward-looking sounders with that expectation have invariably been disappointed. But there are many more for whom a forward-looking sounder has been a godsend, allowing them to creep into uncharted anchorages or rocky bays with confidence. As electronics manufacturers bring the full power of ever-faster data processors to tackle this challenge, systems will grow even more useful. At least now we’re looking in the right direction.